The story of PCDH19. The clinical features and unique inheritance pattern of PCDH19-related epilepsy were first described in 1971, and the clinical entity was coined Epilepsy in Females with Mental Retardation (EFMR), due to the presence of epilepsy and cognitive disability that seemed to be limited to females. 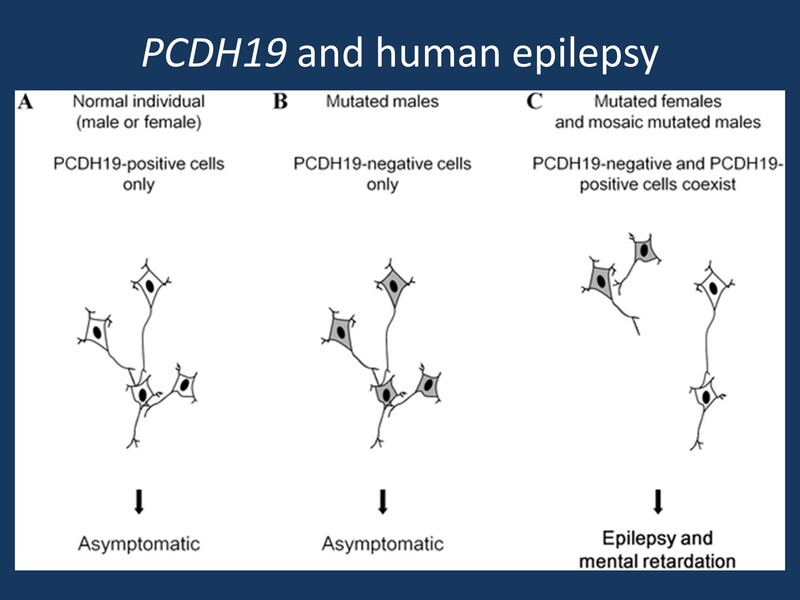 Pathogenic PCDH19 variants were identified in females in 2008, and it soon became clear that PCDH19 is a major player in the genetic basis of epilepsy, with more than 100 patients with PCDH19 variants described to date. The inheritance pattern is one of the most striking features of this condition. Heterozygous females are affected, while hemizygous transmitting males are spared. At the cellular level, the disease mechanism seems to be loss of function. However, at the tissue level, the current hypothesis for the underlying mechanism is gain of function, resulting from the co-existence of two different PCDH19-expressing neuronal populations in females and mosaic males. Keep reading to learn more about recent discoveries related to PCDH19. What we are learning about PCDH19. Our understanding of PCDH19-related epilepsy continues to expand. Here are some of the highlights of what we have learned in recent months. PCDH19 and gene expression. Tan and colleagues recently identified over 90 genes that are dysregulated in females with PCDH19-related epilepsy. AKR1C3 mRNA and protein products were both significantly decreased, as were allopregnanolone levels in the blood. Given these findings, Tan and colleagues propose that neurosteroids may play a role in this form of epilepsy and could be a target for future therapies. A handful of case reports support the efficacy of steroid treatment in treating acute seizure episodes in patients with PCDH19-related epilepsy but more data is needed in order to support this possibility. PCDH19-related epilepsy and therapy. PCDH19-related epilepsy is often refractive to therapy. According to a retrospective analysis of over 50 females with PCDH19-related epilepsy, Lotte and colleagues found that bromide and clobazam were the two most effective medications after both 3-month and 12-month treatment intervals, with a significant percentage of patients showing at least a 50% reduction in seizures. Over 30% of individuals did not show significant seizure reduction with these therapies. PCDH19 and organization of the brain. Recent studies in induced pluripotent stem cells (iPSCs) and zebrafish suggest that PCDH19 promotes the organization of the developing brain. Compagnucci and colleagues found that PCDH19 is expressed in undifferentiated pluripotent cells, often only in one pole of the cell, and co-localizes with other markers of the lumen, thus suggesting that PCDH19 may play a role in creating or preserving positional information required for organization of the developing human brain. Similarly, Cooper and colleagues recently showed that PCDH19 is expressed in discrete columns of neurons in the zebrafish, and these columns appear to develop from a small number of PCDH19-expressing progenitor cells. Loss of PCDH19 expression leads to a loss of the columnar organization, as well as an increase in cell production and a possible decrease in cellular cohesion, again supporting a possible role for PCDH19 in the organization of the developing nervous system. More PCDH19 updates. Visit our PCDH19 gene page to learn more about other updates on PCDH19. Take a look at the additional topics that we have added with our revised gene page content, including sections on the clinical perspective, animal models, references, and research. So in females and mosaic males, are they thinking that the protein arising from the mutated allele is disrupting function of the remaining “good” protein, perhaps in a prion-like fashion? Just curious. tolerated as male carriers with mutations typically do not have symptoms.